Following our ethereal meal at Tenshin, we went into town to eat some more. Settled for Crystal Jade La Mian Xiao Long Bao (Ngee Ann City) because we realise we have never even tried this "flavour" of the ubiquitous chain. Even at a non-peak hour, it was packed to the brim. We just had a noodle and three snacks. 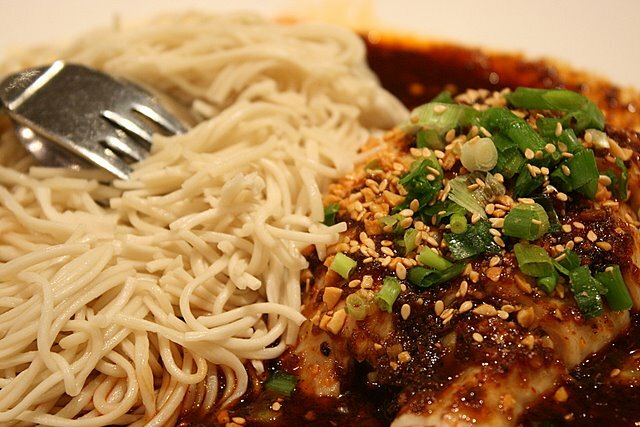 The spicy shredded chicken with la mian (S$7.80) is a cold noodle dish. The chicken came not as shredded breast meat which would have been better, but as chopped drumstick consisting mainly of bone. The tangy-spicy-nutty sauce was certainly intriguing upon first bite, but the taste soon became too heavy, possibly from the overpowering fragrance of Szechuan peppercorns. Oh, they cut the noodles to facilitate sharing. 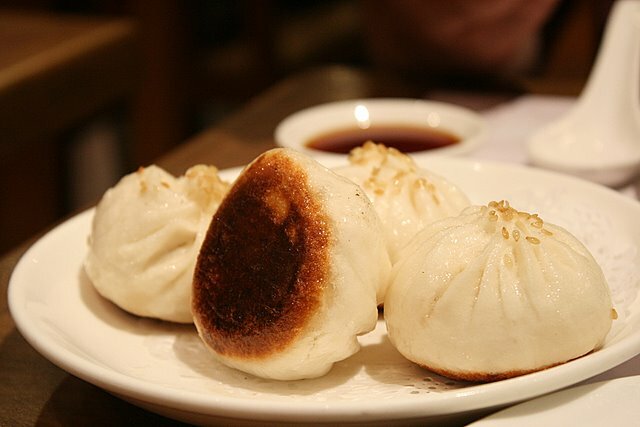 I was very happy to see they had this Shanghainese pan-fried bun (S$3.50 for four). Crispy-bottomed but sweetly soft and chewy skin on top! Very good skin but I'm not too fond of the pork filling - a rounded ball of fatty minced pork steamed a soft pink. 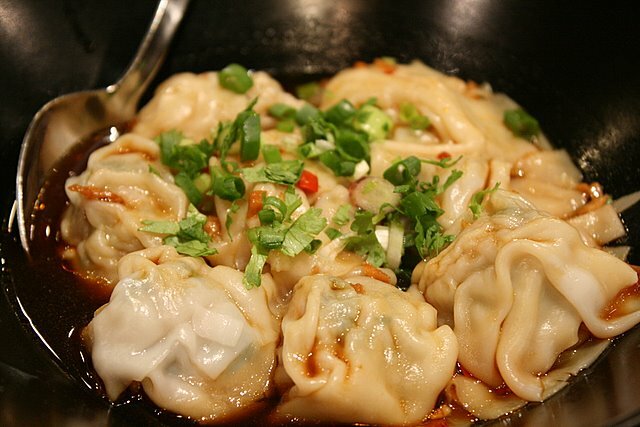 Eight fat dumplings for S$4.80 is a steal! The sauce is not very spicy though, and the filling is the same as that of the pan-fried dumpling above (in that sense, it tasted a bit repetitive). I prefer the elegant version at Jia Wei Restaurant. Those made me want to eat more. This was yummy even if a bit jelak (satiating). 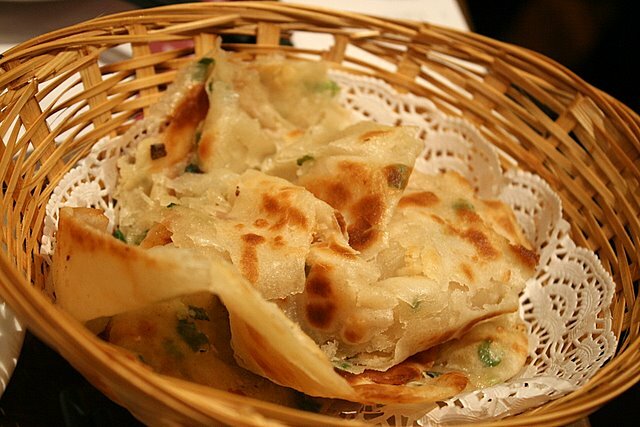 Crispy scallion pancake, deep-fried and shredded. Very much like a crispy roti prata/canai, which it essentially is! No complaints though. We simply tore into it with bare hands and munched away. I should like to try the other items at the La Mian Xiao Long Bao branches, perhaps on a less busy day. The tables are set rather close so it's not conducive for privacy or photography. Service, as expected, is generally fast, brusque, and almost mechanical in its efficiency. The din of the place too, like that of busy Chinese restaurants, can be distracting. But I suppose that's part of its character. Hehe, you're like the first person I know to come up with a half-decent translation for 'jelak' --- usually my friends come up with more verbose terms like "Makes you full and don't feel like eating more of it." P.S. The scallion pancake is so drool-worthy! i think i have too many, way too many post about Crystal Jade. haha..
maybe kenny will be using it in his writings more. hehe..
the cold spicy chicken version in Holland V seems to be the best! very gooooood la mian for sure!